To let visitors (wanted or otherwise) to your site know they are being recorded. 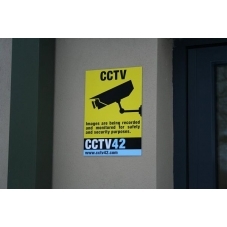 We do not sell warning signs as a stand alone item, only as part of a cctv equipment order or to customers who have previously ordered items from us. Neither do we sell dummy cameras. If it says CCTV42 on the side then smile, you've just been caught on CCTV!